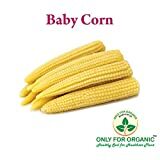 Baby corn is the ear of maize (Zea mays L.) plant harvested young, especially when the silks have either not emerged or just emerged, and no fertilization has taken place, depending on the cultivar grown. 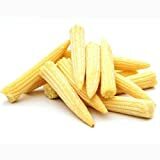 The dehusked young ears of baby corn can be eaten as vegetable, whose delicate sweet flavor and crispiness are much in demand. Importantly is free from pesticides and its nutritional value is comparable to popular vegetables like cauliflower, cabbage, tomato, eggplant and cucumber. It’s by products such as tassel, young husk, silk and green stalks provide good cattle feed. Baby corn provides benefits to people from every walk of life and all disciplines. Farmers can grow four crops in a year, and the production of baby corn generates employment amongst the rural poor’s, from children to the elderly persons. Other sectors of society who are also benefited from the crop are the regional brokers who buy from farmers, canneries, wholesale merchants (for the local market), retail merchants and exporters. Baby corn is a popular vegetable in USA, Europe and Southeast Asia. The demand for baby corn is rapidly increasing in urban areas in India. Baby corn is not a separate type of corn like sweet corn or popcorn and any corn type can be used as baby corn. It is delicacy, which can be profitably used in prolific types of corn i.e. those types , which bear two or more ears per plant. The shank with unpollinated silk is baby corn. The economic product is harvest just after the silks emerge (1-2 cm long). Baby corn has immense potential as a salad and as cooked vegetable. It is used as an ingredient in ChopSuey (Chinese dish), soups, deep fried baby corn with meat, rice and other vegetables. Large number of dishes may be prepared from baby corn as discussed subsequently. Baby corn is highly nutritive. The nutritive value of baby corn is comparable to any common vegetable (Table 1). Since only immature cob is harvested as the economic produce, the crop meant as baby corn can be harvested within 50-55days. Thus in the areas adjoining cities or other urban areas (peri-urban agriculture) multiple crop of baby corn can be raised which would fetch greater income to the farmers. Baby corn can be effectively used as both a nutritious vegetable and as an export crop to earn valuable foreign exchange. After harvest the still young plants may be used as fodder for cattle. The soil requirement, land preparation and crop management practices for baby corn are the same as that for sweet corn and popcorn. For baby corn two systems are used. One system uses standard populations of about 58000 plants per ha, where the top ear is left on the plant for grain corn or sweet corn, and subsequent ears harvested for baby corn. The second system uses high plant populations at a spacing of 45 cm x 20 cm with 2 plants per hill, having a population density of 175000 plants/ha, where all ears are harvested for baby corn. The standard plant populations produce yields of about 46.5 q unhusked ears (4.65 q husked ears) per ha, while the high populations produce yields of about ’93-106 q unhusked ears (9.3-10.60 q of husked ears ) per ha. A seed rate of 20-25 kg/ha is recommended. This would thereby realize more number of cobs and consequently more returns to the farmers. No variety has been exclusively bred for baby corn purpose in India. However, early and prolific varieties like Him 123, VL42, and Him 129. Early composite and hybrid variety Prakash, PEHM 1 & 2 can successfully be cultivated as baby corn (Table 2) . At the time of selection of cultivar preference is to be given for short stature and prolific cultivars. Hybrids are preferred over open pollinated varieties because hybrids are more uniform in flowering. Thus they may require only 4-5 times plucking. Contrary to this nonuniform flowering of varieties leads to prolonged harvesting. Short stature materials can be well accommodated in higher plant densities. Planting time is round the year in peninsular India and February to September/October in North India. Nitrogen is applied @ 150-200 Kg/ha in three equal splits as basal dose at the time of sowing, at knee high stages (20-25 DAS) and at pre-tasseling stages (40-45 DAS). On the other hand, phosphorus and potassium are applied as basal dost at the usual rate of 60 Kg/ha and 40 Kg/ha, respectively. For control of stalk borers Endosulfan 35 EC @ 2ml/l is sprayed on 10-14 days old plants. Isolation from other types of corn does not affect the baby corn crop as the ears are harvested before pollination. However, adjacent sweet corn plantings could be affected by pollen from baby corn varieties of unlike genetic back ground. The baby corn crop planting can also be affected if some ears are left to be harvested as sweet corn. Baby corn being highly remunerative crop they can successfully be cultivated in periurban agriculture. However, instead of cultivating baby corn as sole crop it may be intercropped with other highly remunerative crops like marigold, tuberose, gladiolus, radish spices, pea etc. This provides additional income to the farmers from unit area and makes agriculture more sustainable. The ears are harvested (45-50 days after emergence) when the silks are 1-2 cm long, i.e., within 1-2 days after silk emergence. Feed corn varieties are harvested at silking, while supersweet varieties may be harvested up to the time silks are about 5 cm long but still fresh. Ears quickly become too long and tough. Suitable time for harvesting of ears may be determined by sampling for size. Harvesting is usually done in the morning when the moisture is high and the temperatures are low. The picking of baby corn Is to b e done once in three days and generally 7-8 pickings are required depending on genotypes used. In a good crop on an average 15-19 q/ha baby corn can be harvested. Additional income may also be obtained through sale of green fodder, which may yield up to 250-400 q/ha. The husk is to be carefully removed so as not to break or damage the ear. Ears intended for processing must be carefully hand husked and de-silked. Subsequent to the removal of the ear husks, the shanks are cleared of the silks. Then the shanks are graded based on their size and colour and packed in polythene sheets before marketing. In many cases baby corn for vegetable use is marketed without dehusking of the cobs. This reduces labour involved in processing but fetches less market price. Optimum size for market and cannery industries is 4.5-10 cm long and 7-17 mm diameter of dehusked cobs. Yellow coloured cobs with regular row arrangement fetch better market price. Harvested baby corn may be stored for 3-4days at 10 0C without much effect on its quality. For long term storage and distant transport, baby corn is canned in brine solution (3%), sugar (2%) and citric acid (0.3%) solution and stored under refrigerated conditions. Baby corn may also be stored in vinegar. Baby corn pickle is also gaining popularity in Indian market and it already has an established international market, particularly in Europe. About two decades ago, the idea of producing and consuming corn, as a vegetable was quite new. This is because in most developing countries, corn has an image as grain for the poor or a animal feed, or as both. Moreover, baby corn production needed a higher investment, in terms of inputs and labour., than the farmers used to provide to maize. The extension education campaign has been succeful in fostering the sustained growth of the baby corn industry. Domestic markets continue t expand, and the number of farmers producing baby corn is still increasing. The success of baby corn development is dependent on various factors like government policies to facilitate growth of the economy in general and the food processing industry in particular. A strong cooperation between the Government and the baby corn industry is a prerequisite to popularize baby corn. In addition, in Thailand, for instance, collaboration of various international agencies, including the US Agency of International Development (USAID), the Rockefeller Foundation, the Japanese International Cooperation Agency (JICA), International Maize and Wheat Improvement Centre (CIMMYT) and the Food and Agriculture Organization (FAO), was necessitated for providing the breeding materials, research support, and human resource development. New sources of germplasm have been introduced. Appropriate germplasm and breeding methods have subsequently been supplied to evolve suitable varieties and hybrids and also to develop suitable production and processing techniques. This has involved sustained cooperation among researchers and development officials for the testing of technologies over locations, seasons and years. Finally, the progress in establishing sound baby corn research and development has been fostered by transferring technology through effective public awareness campaigns. For the long-term development of the baby corn industry in the region, the research and development must be integrated using an interdisciplinary approach. The cooperation of the public and private sectors is, therefore, crucial. Concerted efforts in the future would be desirable, and team work should address the following areas. Cultivars should be hybrids (preferably single cross) that give high yields of uniform, good quality ears that meet the specifications of the canning industry. They should mature early and be prolific and adaptable to a wide variety of conditions. Certified seeds of these hybrids should be made available in sufficient quantities to the farmers. In order to obtain high yield and good quality, attention must be given to the interplay between variety and soil fertility to secure maximum benefits. Also, efficient water management practices would be desirable. Plant Protection and Residual practically no application of pesticides, thereby eliminating the residue factor and minimizing on production cost. Hence, resistant hybrids need to be promoted in the future. The baby corn industry requires a lot of labour for harvesting and dehusking. As labour costs are increasing, it is necessary to promote mechanization in the future. Even though baby corn has husks to protect the young ear, its freshness can be maintained for only a limited time. Therefore, information on maintaining good baby corn quality either for export in the fresh form or for processing in canneries should be made available to persons involved in the business. Also, research on the subject would have to be intensified. The quality of the product reflects upon the reputation of both the cannery and the country of export. Thus, rigorous quality control is needed to ensure that international standards are met. Added efforts in this field would thus be helpful in promoting the baby corn industry further in the region. It takes time for the output of inter-disciplinary research and development to be transferred to the persons involved, starting with the farmer who produces the raw materials, then to the canneries where the finished product is processed for the consumer who eventually prepares and eats the product. Nevertheless, this is essential for the success of the baby corn business. So, concerted efforts in this direction would be critical in the future. The price of baby corn should be reasonable, stable, and the product should be free to flow from farm-gate markets to the regional markets, central markets and the destination markets both within and outside the country. Pricing and procurement policies in countries interested in promoting baby corn would eventually determine the success of new ventures such as baby corn in Thailand. Corn will remain one of the most important field crops in developing countries. Young people who are involved in this business will be able to make a contribution to society. Government in these countries should, therefore, concentrate on the development of young farmers, researchers and extension agents, cannery managers, and others involved in the private sector to find creative ways to sustain the baby corn industry. Thus, policies for required human resource development would go a long way in the proper adoption of such innovative policies. National efforts need to be complemented and reinforced by regional cooperation through activities such as; the exchange of information and germplasm; the regional testing of selected hybrids and varieties; joint meetings and visits; human resource development and training, collaborative efforts for research and development (involving both public and private sectors); and the sensitization of policy-makers for appropriate interventions arriving at suitable adoption of baby corn production and processing technology. In India no cultivar has been exclusively bred for baby corn purpose. Prolific and early maturing cultivars have been mostly popularized as baby corn cultivar. In order to encourage uniformity in the material more emphasis is to be given towards development of early maturing prolific hybrids. As baby corn with light yellow colour and regular row arrangement fetches better market price, at the time of breeding for baby corn attention must be kept in this direction. 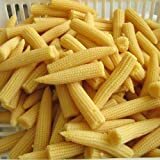 In recent past baby corn has gained popularity in regular vegetable markets in urban areas. However, keeping in mind the nutritive value of baby corn there is a need to popularize it further in other urban and rural areas. Though baby corn is being sold in domestic market, they are being sold without proper processing. As a result there is considerable reduction in qualities of the cobs. This is principally due to lack of awareness among the farmers and due to non-existence of proper storage facilities and location of the farms far away from the market. Thus there is a need to develop appropriate entrepreneurship and establishment of appropriate storage and marketing facilities and popularization of baby corn cultivation in periurban agriculture. However, this is dependent on organization of markets and support from government sectors. Where baby corn is being grown for further market and export, extra care is to be taken to process the cobs and can them within two to three hours of harvest. Otherwise they will lose their nutritive value.